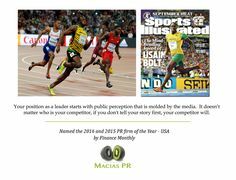 Macias has run start-up campaigns, political campaigns as well as established media and crisis campaigns. Let us help your business identify the narrative and story ideas that will get you in the news. Feel free to give us a call at 646.770.0541 or email us at Info@MaciasPR.com. You can learn more about our PR Agency at www.MaciasPR.com.